Brooklynn & Laura enjoying the sunset. Laura, I know life has pulled us apart from a young age. We went years without communication, years without knowing what happened to one another. Little did we know the trips down to Disney on Ice every year would be the memories we hold close to our hearts as teenagers. We both looked forward to that car ride to Indianapolis every year! Just to get the chance to see each other. Not knowing that after the trip in 2009 would be our last. One of the earlier trips to Disney on Ice. The next few years seemed to fly by, and my mind always wondered what happened to my adventure buddy. We are not as close as our mothers were at our age, but it’s okay we will get there. If it weren’t for social media, we still might be wondering how the other one is handling life. One message was all it took for us to reconnect as if we never lost connection. Over the last two years we have grown closer than either of us ever intended. I guess you could say we are slowly becoming our mothers, following in their footsteps. 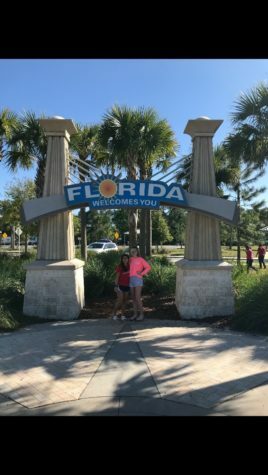 Last week we went on our senior spring break together, just as they did in their younger years. That trip to Madeira Beach definitely will be talked about forever. From the long car rides to the late night conversations, we shared so many laughs. Even though we had the world’s most annoying bed and a fear of dying, we still had fun. The first time we had seen each other since we were almost ten years old. We were both sixteen when this picture was taken. I would not have wanted anyone else to join me on that trip. We found out how each of us has grown as a person from the last time we met in person. We are similar in so many aspects and life and where we are headed within the next five years. From the future plans we talked about to even running down hallways like the little kids we are, I know that we will be okay in life. We have goals set and a friendship strong enough to overcome the distance, the struggles, and even maybe a few fights. We waited entirely too long for this ice cream. So Laura, thank you for adventuring with me again. Thank you for making my final spring break in high school one to remember. A huge thank you for also taking care of me because we both know that’s not easy. I would never trade our friendship for anything even if it was dying in the purge together (inside joke). 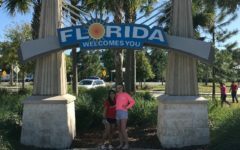 Great article Brooklynn, it’s nice to see reconnections among friends. I think it was cool to see how your friendship has developed over the years especially when you girls were apart for a few of them. I hope you both had an amazing spring break. Great article! This article was very well put together! I thought it was cool how you explained how you and your friend had been close in younger years, and then later developed the same friendship. I thought it was interesting because I also have a friend like that, he moved to kokomo a few years ago and we somewhat lost contact, then last year hung out a lot more and found that same undying friendship. Keep up the good work. This is a really nice article. I think it is awesome that your two are friends even if you guys havent been around each other your whole lives. This was well written and i really like how you added multiple pictures. Great article. I love how well put this article was and how you somehow managed to express your feelings so well into words. You have a crazy talent for writing and I love reading every single article you write! This article felt touching and simple at the same time. Good job Brooklyn! Great Article Brooklyn! Really love how you explained how you have felt. Finally being able to hangout with you friend must have been fun. Brooklyn that was a great story! I am happy you guys are close again. Great article! I hope that I become that close with my friends in the future. Great article!! I thought that this article was put together very well. It is nice to know that you reconnected with her after months. Good article Brooklyn, it’s good to see you guys were still friends even after you guys drifted apart for a while. The pictures really show you guys had a good friendship, good article. Great Story! I’m glad you got to see your best friend. I thought your article was fantastic and hearing about how you got to reconnect with a long buddy of yours.